Species trait data and environmental variables used for analysis of correlates of extinction risk in 1,139 squamate reptiles. For each species, data on extinction risk, range size, reproductive mode and output, body size, trophic group, biogeographical realm and island endemism is given. In addition, the file holds environmental data extracted across each species' range from spatial data layers on climate, net primary productivity (NPP) and human pressures (population density, human appropriation of NPP, accessibility, etc.). Non-dated composite phylogeny of squamate reptiles (1,139 species + Sphenodon punctatus as outgroup) as used in our analysis of extinction risk correlates of squamate reptiles. This zip file contains the data file holding the phylogeny in text format, and a Word document describing how the phylogeny was constructed, as well as literature citations. 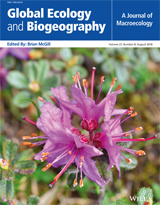 Aim Evaluating the relative roles of biological traits and environmental factors that predispose species to an elevated risk of extinction is of fundamental importance to macroecology. Identifying species that possess extinction-promoting traits allows targeted conservation action before precipitous declines occur. Such analyses have been carried out for several vertebrate groups, with the notable exception of reptiles. We identify traits correlating with high extinction risk in squamate reptiles, assess whether these differ with geography, taxonomy and threats, and make recommendations for future Red List assessments. Location Global. Methods We collected data on biological traits and environmental factors for a representative sample of 1139 species of squamate reptiles. We used phylogenetically controlled regression models to identify general correlates of extinction risk, threat-specific correlates of risk and realm-specific correlates of risk. We also assessed the relative importance of range size versus other factors through multiplicative bivariate models, partial regressions and variance partitioning. Results Range size was the most important predictor of extinction risk, reflecting the high frequency of reptiles assessed under range-based IUCN criteria. Habitat specialists occupying accessible ranges were at a greater risk of extinction: although these factors never contributed more than 10% to the variance in extinction risk, they showed significant interactions with range size. The predictive power of our global models ranged from 23% to 29%. The general overall pattern remained the same among geographical, taxonomic and threat-specific data subsets. Main conclusions Proactive conservation requires shortcuts to identify species at high risk of extinction. Regardless of location, squamate reptiles that are range-restricted habitat specialists living in areas highly accessible to humans are likely to become extinct first. Prioritizing species that exhibit such traits could forestall extinction. Integration of data sources on human pressures, such as accessibility of species ranges, may aid robust and time-efficient assessments of species extinction risk.